Convenience. But, in the short term, yet another distraction for drivers, though the anticipation is that this is really designed for the advent of driverless vehicles. The other issue is what this does to the notion of auto ownership: if the software and connections are so valuable to the manufacturer and to the connected merchants, who actually retains legal title to that software and the information it contains? And who retains ownership once the car is sold? Since December, G.M. has equipped about three million cars with an in-dash system it calls Marketplace. The free-to-use system communicates directly with merchants, enabling a driver or passengers to order and pay for a variety of products and services without a cellphone. Vendors include McDonald’s, Shell, Exxon Mobil, Dunkin’ Donuts, Applebee’s, Delivery.com, IHOP, Parkopedia, Priceline, Wingstop, TGI Fridays, Office Depot and Yelp (for restaurant reservations). Many owners of cars equipped with Marketplace probably don’t even know it’s available. Only about 75,000 people have signed on, and it’s not mentioned in any car manuals. G.M. wanted to allow time for refinement and for lining up more merchants, but is now starting to promote the system to consumers. 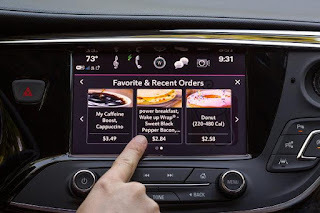 Marketplace interacts with G.M.’s infotainment system and establishes a dialogue with the car owner. For example, if the car is running low on fuel, Marketplace can provide directions to the nearest gas station. The system allows drivers to sign up for the vendor’s reward program and can point the way to discounted gas. There is no need to swipe a credit card at the pump, because Marketplace handles the transaction and turns on the pump. Marketplace communicates by means of a 4GLT modem that can connect to a cellular network or Wi-Fi. G.M. was well situated to adopt this technology, because its vehicles have been equipped with modems since OnStar’s debut in 1996. Other carmakers have introduced modem-based communication systems, but G.M. has made the most comprehensive push into mobile communication and marketing. SIM cards, which carry an identification number unique to the owner, are now in 130 million vehicles globally, Mr. Liniado said. “Bluetooth and the phone are gone,” he added. The driver or front-seat passenger can interact with Marketplace by touching the dashboard screen. Voice command technology is in development, Stefan Cross, a G.M. spokesman, said. Dr. Reimer said engineers were devising systems that can determine how often and how long the driver is looking at the road, and issue alerts and warnings if the driver’s attention wanders. For those driving older vehicles, some retrofitting will be possible. Verizon offers a modem device and feature set, called Hum that is similar to what is built into new cars and plugs into the onboard-diagnostics port of most vehicles from 1996 and later, and Mercedes-Benz dealers in Britain are retrofitting communication ability in many cars built since 2002.